In other news, the new Kickstarter has cleared stretch goal #3! That means both our paperback and hardcover versions of Volume 5 will now contain a bonus chapter full of author commentary and concept art. (There will also be similar sections ad to the Hardcover versions of 1-3, since those three books didn't have any in their original paperback form.) Up next on the stretch goal spectrum are exciting President Dog bonuses and some luxirious cloth bookmarks for our hardcovers. Wish us luck! We return on Friday with a new comic and a new round of Q and A. (If you've got a question you'd like me to answer, just tweet it at me or pop it in an email with "Q and A" in the subject line.) See you then! 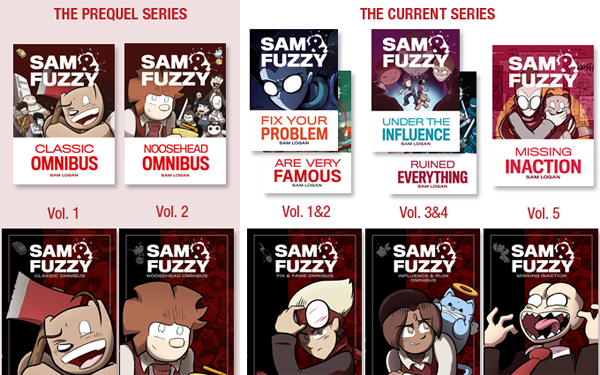 The new Sam and Fuzzy Kickstarter rages on, and I am very proud and excited and generally full of energy about it! 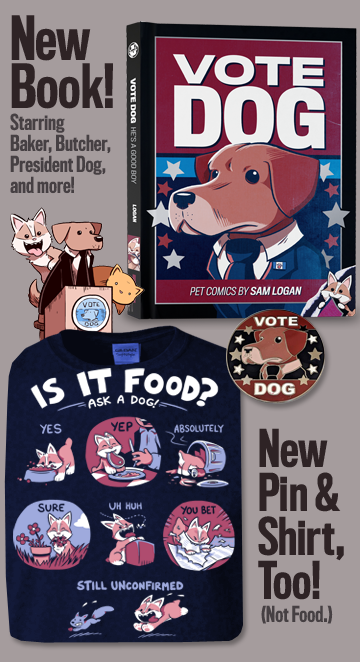 Backers have already crushed our spot gloss and bonus e-artbook stretch goals, and are now chipping away at a trio of potential new additions: author commentary and concept art, a special afterword from President Dog (with bonus Vote Dog bumper stickers), and luxurious cloth bookmarks and silver ink for our hardcovers! I am very excited these bonuses are even on the table. Getting to do stuff like this is why I love the Kickstarter process so much... the support of backers actively improves the product being made for them. It is a good system and it is going to result in some stupidly pretty books. Check 'em out, if you haven't already! All right, team! We return on Wednesday with our next comic. Be here or be square! I am sorry it's a little confusing! It's my fault for having so many books. Let me break it down for you! 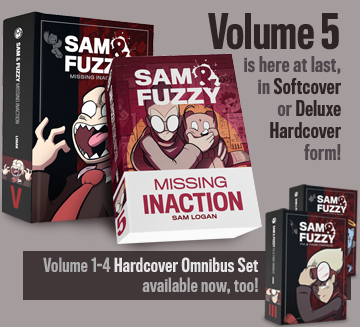 Volume 5 (Missing Inaction) contains everything from here to here. In other words, it's the chunk of story where Fuzzy was abducted by Hazel! The book includes the infamous Undercover Burlesque story, the big Vampire Aid concert, Hazel and Fuzzy's various adventures on the run and all of the stuff with Roan, and the big showdown with Mr. Sin and his Buddy Bear forces. It is my favourite book in the new series! Those are some of my favourite stories that I've done, ever. The Volume 1-5 set collects the entire new series so far... everything from the first comic where Hazel was introduced right up to the end of Volume 5. The softcover set is five books and the hardcover set is three books, but they both collect the same run of comics. (The hardcovers are just bigger!) The hardcover set is BRAND NEW, while the softcover set includes the versions of 1-4 that Topatoco made over the last few years. The Complete Saga set includes Volume 1-5 that plus the separate original Two Volume Omnibus that we kickstarted back in 2013. Those two earlier omnibuses collect the big Classic and Noosehead prequel stories -- ie, everything prior to the introduction of Hazel. The new series works fine as a stand-alone reading experience, but if you want the complete run of S&F, this is the set to get. Both the Volume 1-5 set and the Complete Saga set are available for a special discount price via the Kickstarter. I know it's an intimidating quantity of reading material, so I wanted it to be a good deal! And if you buy them via the Kickstarter, you'll help contribute to stretch goals that add rad bonus features to Volume 5. We've already hit our first goal -- luxurious spot gloss -- and are on our way to a big bonus commentary and concept art section. I am pretty stoked! Fuzzy and Dev couldn't be here today, I'm afraid, so I'll do my best to cover for them! Devahi currently holds the highest level of command in the Ninja Mafia -- or at least, the non-robotic half of it -- second only to Sam. I'm not sure what you'd call it, since it's not a traditional position in the organization. In the past, the various Mafia Commanders all reported to the Emperor, but Sam recently agreed to place Dev as a sort of surrogate commander-in-chief while he steps away to focus on the Committee and the Buddy Bots. So that makes her some sort of... SUPREME commander, I guess. Fuzzy holds no rank in the Ninja Mafia! He is currently the CEO of the Graves Group, which makes him a Committee equivalent to Sam. It would be very gauche for one Committee member to serve beneath another, I think! Jeph was officially dismissed from his position as my arch rival when he moved to Canada. Now that he's one of us, it just wouldn't do! I believe Jeph's current nemesis is David Willis, my American doppelganger. I, on the other hand, am currently taking a hiatus from arching, to really focus on my mad science. That's a wrap for this week! 'til next time, friends. See you Monday!